Sibu-IP is a solution developed by Anvimur Telecomunicaciones allowing operators to professionally transcodetheir channels to be sent to IPTV / OTT platforms in a simple, intuitive way. 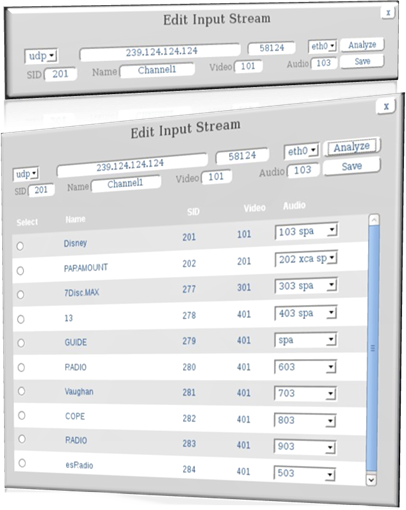 Sibu-IP is a professional multichannel audio video transcoder that provides a powerful engine for multimedia processing; ideal for OTT/IPTV solutions. Sibu-IP is installed on ultra-fastprofessional Intel Xeon E5 chipsets on Supermicro boards, offering a great tool for your Project. It is capable of transcoding / encoding up to 8 SD or HD. The Sibu-IP transcoder of multiple HD/SD channels improve the transcoding efficiency and decreases the retard time. It supports a wide range of operative programs from low to very high bit rates. The device has the latest advances in video coding, whichmeets H.264 and MPEG. Real-time transcoding of up to 8 video sequences. Multi-format of IP2IP (H.264, MPEG2) video transcoding. Thin Supermicro server 2x1U rack design. All SD and HD resolutions supported. Supports a wide range of binary speeds per channel, from 1Mbps upwards.